Three fifteen minute poses. One above two below. Conté pencil highlighted with conté crayon on tinted pastel paper. 32.5 x 50 cm or 13 x 19 3/4 in. A four minute pose. Conté pencil on toned sketching paper. 35 x 50 cm. or 13 3/4 x 19 3/4 in. This entry was posted in Drawings, Figure Studies and tagged 15 minute figure study, figure drawing Bruges, figure study with pastel on March 14, 2016 by ellentrezevant. Figure study. April 2012. Pastel figure drawing on toned paper. 30 x 45 cm. or 11 3/4 x 17 3/4 inches. 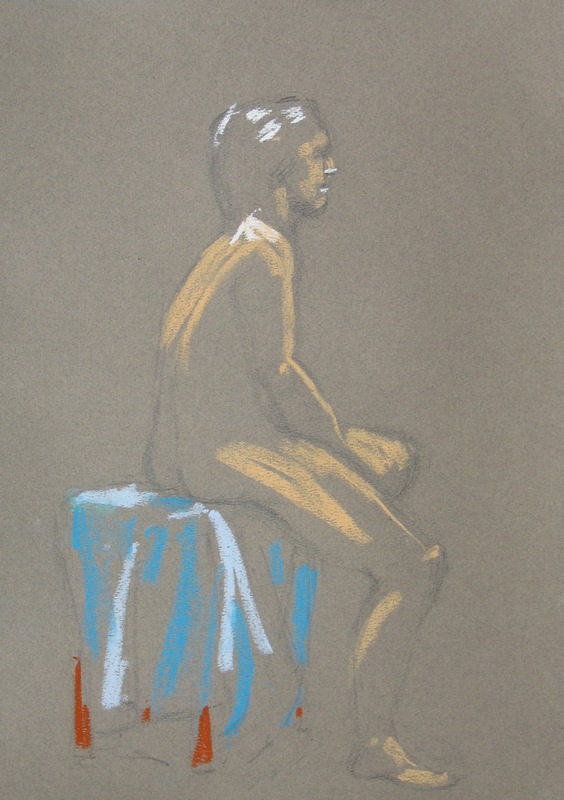 This entry was posted in Drawings, Figure Studies and tagged 15 minute figure study, figure study heightened with pastel, figure study with pastel on April 22, 2011 by ellentrezevant.